With the help of the Rotary Clubs in Caribou, Fort Fairfield, Limestone and Washburn, the University of Maine at Presque Isle and the Presque Isle Rotary Club are declaring their 3rd annual World Polio Day and Purple Pinkie Project celebration—which spread throughout central Aroostook County and was held between Oct. 18 and 25—a big success. All activities helped to raise awareness of Rotary International’s efforts to eradicate polio worldwide. Combined efforts among the clubs helped to raise an estimated $2,600 for that global effort. This year’s World Polio Day activities helped the area Rotary clubs to significantly increase local awareness about Rotary’s worldwide fight to end polio and raise enough funding to ensure that thousands of children receive polio immunizations. World Polio Day takes place every year on Oct. 24. One of the big ways the Rotary clubs celebrated the occasion was to host several Purple Pinkie Project stations around the region. Volunteers were on hand to color the pinkies of anyone willing to donate $1 toward Rotary International’s “End Polio Now” campaign; $1 is the estimated cost to immunize one child from polio, so a purple pinkie serves as a symbol for one polio immunization. Similar Purple Pinkie projects have been held by Rotary Clubs around the country, with people donating $1 to have their pinkies marked with the same topical purple dye Rotary International uses when it conducts polio immunizations. The dye is used to prevent double dosages. On Oct. 18, the Fort Fairfield Rotary Club hosted a Purple Pinkie table during its 2014 Cash Draw event. On Oct. 20 and 22, Purple Pinkie tables were set up during the Presque Isle and Caribou Rotary Clubs’ respective weekly Noontime meetings. On Oct. 23, Presque Isle Rotarians hosted Purple Pinkie stations at Presque Isle High School and Presque Isle Middle School. UMPI Business Club members also hosted a Purple Pinkie station for employees at MMG Insurance. On Oct. 24, Rotarians across central Aroostook County wore purple polo “polio” shirts to spread awareness of Rotary’s End Polio Now efforts. Some of the funds from the shirts go directly to End Polio Now efforts. 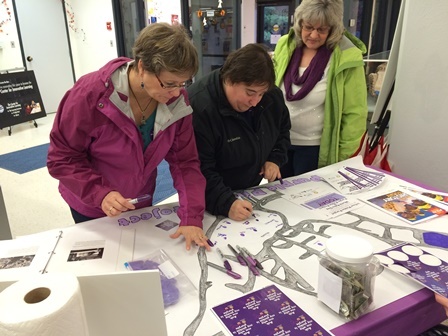 Also on Oct. 24, community members were able to take part in the Purple Pinkie Project at stations set up at UMPI, Northern Maine Community College, TAMC, and UMPI’s Houlton Higher Education Center. On the evening of Oct. 24, during the Limestone Rotary Club’s 64th Annual Auction, Limestone Rotarians shone a spotlight on World Polio Day. Club members wore their purple polo polio shirts and took time during the auction to raise awareness about Rotary International’s polio eradication efforts. 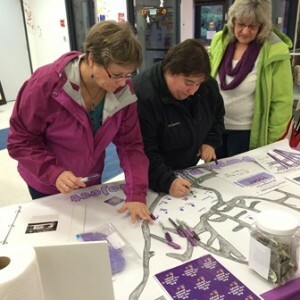 Activities capped-off with one last Purple Pinkie table on Oct. 25, hosted by the Caribou Rotary Club during the Caribou Craft Fair. The club was able to display an iron lung on loan from Eastern Maine Medical Center at that event. The Washburn Rotary Club hosted a World Polio Day fundraiser earlier in the month—a “Skip-A-Meal” activity, with proceeds going to the Purple Pinkie Project. Washburn Rotarians also will be hosting Rodney and Barbara Leach at an upcoming meeting to talk about their connection with the disease—Barbara Leach is a polio survivor. Rodney Leach shared the couple’s story during last year’s 2nd annual World Polio Day celebration. This year’s World Polio Day activities carried on a tradition of raising many local dollars for, and even more awareness about, Rotary International’s efforts to eradicate polio. The first annual World Polio Day and Purple Pinkie Project event, held in October 2012, saw an estimated 1,000 people in the community participate and initially raised $1,250. An anonymous donation of $1,000, however, pushed the fundraising total to well above $2,000. Last year’s event raised another $1,775 and saw an even greater number of community members participate. Since Rotary International began the fight against polio in 1985, the crippling disease has been reduced by more than 99 percent—from more than 350,000 people, mostly children, in 125 countries, to less than 300 cases so far this year. Attention is focused on three countries—Afghanistan, Nigeria and Pakistan—which are still polio-endemic. By partnering with the World Health Organization and other government and private groups, Rotary International is working harder than ever to end polio: experts say that if the job isn’t finished, the disease could rebound to 10 million cases in the next 40 years. This year’s event was sponsored by TAMC, NMCC, and MMG Insurance. To learn more about the event, please visitwww.umpi.edu/worldpolioday.